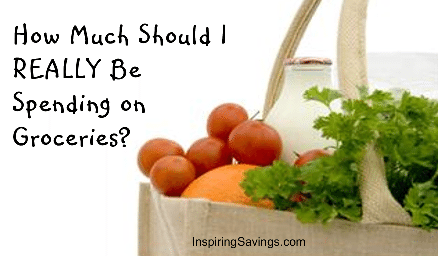 Ever wonder how much you should be spending on groceries? This article narrows it down with easy to understand statics based on the average American family. See where your family stands. Are you with the majority? Keep your groceries within budget. The BIGGEST question or challenge I was faced with when I first started being frugally minded about saving money was; “How Much Should I Be Spending on Groceries and what would be considered “normal” and what would be considered “frugal”? Should I be spending that much on an item just to get my mini stockpile started for my family or even if it is on sale will my family use it? 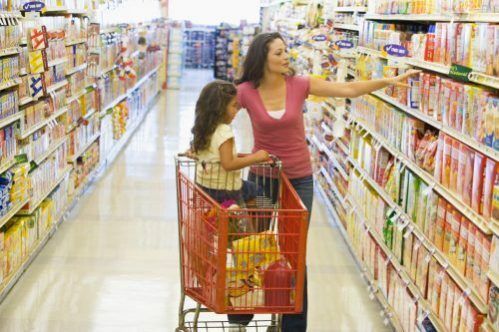 As you know, there are many factors involved in determining your family’s food budget. People eat just differently. While we all have our own ideas about nutrition, every family will vary based on likes and dislikes. Some may only purchase organic produce or have special restrictive diets; such as gluten-free. Some people may include nonfood items such as personal care items and pet food in their weekly grocery budget. Others may even have smaller grocery budgets because they like to eat out a few times a week and only need a few days of grocery-related items at home. Let’s take a look at what the average family of four spend on groceries. I did a little research and checked the Government’s statistics on the USDA website (Lasted updated 4/2016). Comparing my family of four to yours will, of course, be much different. Here is a good starting point. According to the USDA website, the average cost for a family of four with two children under 5 is $129.70 weekly or $4.59 per person per day on a THRIFTY PLAN. This would assume, using coupons and price comparing while shopping. For those who do not pursue thriftiness and use a more liberal approach to shopping could spend and at an average of $253.80 a week or $9.06 per person per day. For my family, by using my “5 Tips on How to Save Big At the Grocery Store Each Week! !“, we spend and an average of $55- $95 per week. My budget includes fresh produce and most of the time I am able to purchase organically because it is surprisingly cheaper than the non-organic counterpart. We do have access to fairly cheap in-season produce, but prices on most items are more expensive than other parts of the country. Really, the issue of how much to spend on groceries boils down to your family’s needs and values. You may have a higher income and believe strongly in purchasing all organic foods, for example, that is what you should do. Or you may have a lower income and believe strongly that you should eat only organic food, then you will have to make sacrifices elsewhere in your budget to be able to afford the higher cost. If your goal is to save as much money as possible, there are many ideas you can implement to bring your grocery bill down to a level, which is much lower than what the USDA suggests. To get started, lowering your bill I have compiled a hefty list of reading material to help you on your way. But it all comes down to first Creating a Budget that works with your family. What do you think? Is your family above or below the USDA’s calculations?